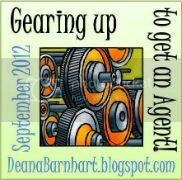 GUTGAA stands for Gearing Up to Get an Agent Blogfest/Pitch hosted by Deana Barnhart. There’s still time to join the fun, meet fellow writers and perhaps catch the eye of that agent you’ve been searching for. I joined not only because I've started querying a new manuscript, but also to get out of my writing cave and my own head for a while.